The Connection tab allows you to configure how Comodo Internet Security should connect to Comodo servers for receiving program updates etc. If you are using a Proxy server in your network and if you want CIS to use the Proxy Server, the Proxy settings can be configured through this settings interface. Select 'Use http proxy' if you want Comodo Internet Security to use the Proxy Server. Enter the proxy server IP address or name in the 'Server' text box and enter the port number in the 'Port' text box (Default = Disabled). If your Proxy Server needs authentication, Select 'Proxy server requires authorization'. Type your Login ID in the 'Login' text box and enter the password in the 'Password' text box (Default = Disabled). 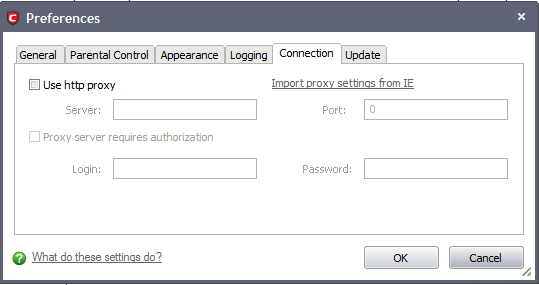 If you want Comodo Internet Security to acquire the proxy settings from your Internet Explorer, just click 'Import proxy settings from IE' link (Default = Disabled).